Welcome to the Bieszczady Mountains ! Not so far in the picturesque Carpathian range lies notoriously quiet yet at the same time playful Bieszczady mountains. The perfect piece of paradise & home to Solinianka Villas & Spa- One of a kind and unique eco friendly Boutique Hotel & Ayurveda SPA . It distinguishes itself with the Signature roofs , cozy rooms and charming location sculpted by nature itself. Enclave of peace and tranquility in a harmony with nature. Simply relax at our Boutique hotel in the sun-washed cirque & bask by the crystal blue mountain stream. You can hear the authentic music of nature - the rustling of trees, singing of birds & the quite murmur of the mountain creek . It’s The romantic getaway to relax and recharge your energy with the help of nature. Our Boutique hotel , restaurant & Ayurveda spa is the most photografed property in Solina-the most popular tourist destination, located only at a 15 minutes brisk walking distance, through the hospitable village from the lively dam of Solina and it takes only 8 minutes drive to reach the Village Polańczyk. Mountain Berdo -A paradise for Freeriders is only 800 meter from our resort and we are located only 18 km away from the snow covered ski slopes in Ustrzyki Dolne or Lesko. We are only 40 km away from the village Arłamów, where at the beginning of 1982, chairman of the "Solidarity" movement - Lech Walesa, was interned & only 60 km away from Medzilaborce, which is known primarily for the modern art gallery, located in the local house of culture & presents original works of famous Andy Warhol and his brothers Paul and James. (Warhol family before emigrating to the United States lived in the nearby village Miková). Day trips to beautiful sentimental Lviv And the thermal spa pools in the caves of Miskolc (Hungary) are very popular among tourists & our guests. Surroundings of Solina and the Bieszczady Mountains is a paradise for fishing enthusiasts. For many years in the waters of the River San fly fishing competitions are organised. Welcome to an excellent form of spending your vacation - a weekend in the Bieszczady Mountains. Forests surrounding Lake Solina and Mieczkowieckie are well known for their pure and rich Runo, where you will find not only porcini mushrooms , boletes, Chanterelle, Leccinum griseum but also many other rarities . Excellent location of our Spa is also very convenient for amateur mushroom picking. 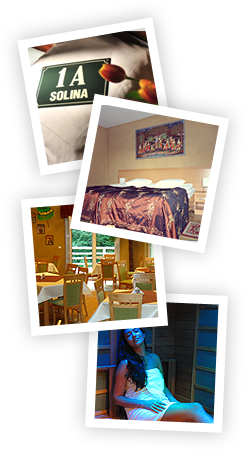 Accommodation in 31 cozy clay sculptured hotel rooms , Aperitif bar with fine wines, delicious dishes in a restaurant with a terrace overlooking the stream, multifunctional conference hall, and many attractions! We offer among other tourist attractions, romantic evenings, friendly getaways, even professional conferences or unforgettable wedding parties in the mountains! We also invite you to visit and like of our profile on Facebook. Welcome to Relax at Solinianka Villas & SPA in the scenic Bieszczady Mountains by the Lake Solina!